Armed with many state-of-the-art and highly sophisticated peptide instrumentations; 400Hz NMR, 2 units of FT-IR, 10 units of MS, Amino Acid Analyzer, 96/102 well automated peptide synthesizers, microwave-assisted peptide synthesizer, microplate reader, 200 units of analytical and preparative HPLC, we are able to produce more than 6,000 peptides per month. A.P.Noke has become one of the most recognizable custom peptides worldwide and renowned among many international customers for having the most completed listing of peptide related products ever offered. 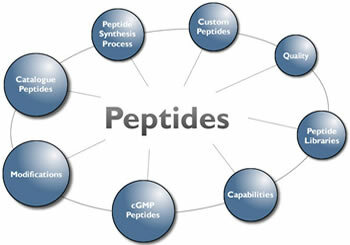 We provide high-quality peptides with favorable price. And the quantity ranges from several grams to dozens of kilograms. We constantly develop new products, so if your requirement is not stated in our product list, please contact us and we are willing to provide you with the best service.